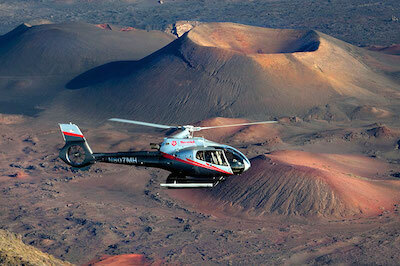 Here is our choice selection of Maui helicopter tours -take your pick! 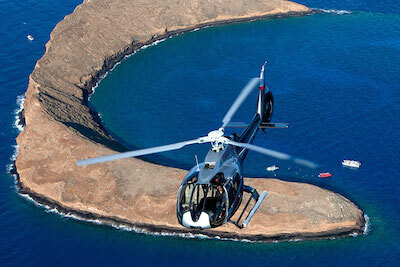 Exploring the Island of Maui by helicopter will be the highlight of your vacation. The trips are designed for small groups and run by experienced professional companies. See sights that you would never dream of and re-live Jurassic Park as you fly over spectacular waterfalls that crash down into the dense rain forests. See a dormant volcanic crater from above and discover regions of the islands that are inaccessible by land. Get romantic chasing the sunset and stop on a private cliffside to propose! There is a tour for all tastes. 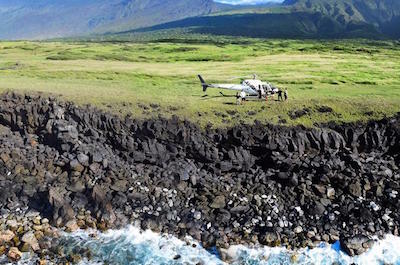 The Aloha Helicopter adventure is the perfect Maui helicopter tour for travellers who are pressed for time but still want to experience all that the Island has to offer. The trip lasts for approximately 30 minutes and departs from the Kahului Heliport. Brings along your camera, sunscreen and photo ID. Be awed by the beauty of the landscape as you fly along the north coast and see the massive waves breaking on the shore. Known as the PeÕahi, these huge waves are some of the largest in the world and attract super surfers from around the globe. See the picture-perfect waterfalls of the Wailua Valley and the dormant volcano in the Haleakala National Park and the bamboo covered OheÕo Gulch. Ride the Hana Highway from the sky, passing over the famous Jurassic Rock, featured in the movie and known to the locals as Keopuka. Your professional pilot will update you on all you are amazing sights you are seeing. 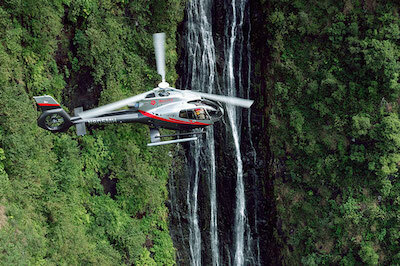 Combine a flight and a land adventure on our next recommended Maui helicopter tour. The Hana Rainforest Experience flies over the northern section of Maui, showcasing the coastline and the inland rain forests. Set off on a 75 minute trip, which includes a 30 minutes landing, that departs from the plush terminal at the Kahului Heliport. You will fly over the most magnificent scenery Ð see the views of breathtaking sea cliffs and crashing waterfalls. View Paia, Hookipa, Haiku and the world famous surf destination, Jaws, from the sky. 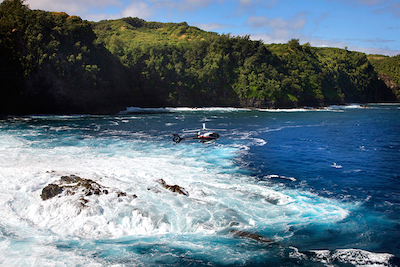 Fly above the Road to Hana and then snap photos of the iconic Jurassic Rock. The helicopter will land at an exclusive pad in the middle of the Rain Forest where you will get a chance to explore on foot. Then fly over an old taro plantation in the Wailua Valley filled with lush fields of coconuts, bananas and exotic wild flowers. Soak up the stunning vistas of canyons and waterfalls while pilot gives you an insight into this fascinating land. Calling all romantics! Take your loved one on a sky ride to see awe-inspiring sunsets from a helicopter. The Sunset Odyssey is our next fabulous Maui helicopter tour. Set off on a 45 minute trip that departs from the VIP terminal at the Kahului Heliport. The tour takes you to three islands, in search of the most magnificent sunsets in this tropical paradise! First fly over Maui itself and see the lush coastlines and spectacular ocean views. Then fly over the clear waters of the Pailolo Channel to Molokai where you will view ancient fish ponds filled with brilliantly colored aquatic life. Snap photos of the famous Elephant Rock, a massive bare rock resembling a huge elephant emerging from the sea. You then head to the tiny Lanai and look out for the rusted World War II navy vessel stranded on the reef at Shipwreck Beach. As your pilot turns back to Maui, see the submerged volcanic crater Molokini and the cascading waterfalls in the dense jungle. Finally, the glittering lights of the shore resort towns beckon, set against the backdrop of a magical tropical sunset! Get right into the Maui spirit as you circle the entire eastern section of the Island on this exhilarating Maui helicopter tour. Meet your personal pilot at the exclusive launch pad at the Kahului Heliport for a 50 minute excursion, ideal for the whole family. You will get a bird's eye view of the famous volcano, the Haleakal? crater, the world's largest dormant volcano defined by its moonlike crater and valleys of lava flows. See magnificent cascading waterfalls in the dense green jungles of the Hana Rainforest. Remember Jurassic Park? This is it! The trip takes you over the most isolated areas of the island that cannot be accessed by foot or vehicle. View the Manawainui Valley, Old Hana Town and the stunning Maui coastline. In the distance you can see the nearby island of Molokini and the cities of Wailea, Kihei and Makena. If you fly in winter, your pilot will point out the famous humpback whales that venture past these exotic islands on their journey across the oceans. Looking for the next fabulous thing to do in Maui? 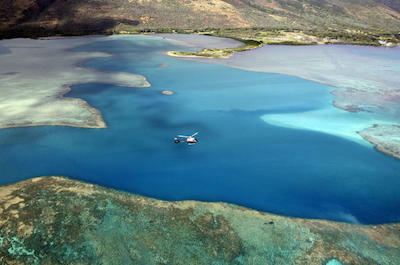 Take the family and join the Molokai Voyage in a helicopter! This Maui helicopter tour lets you discover the magic of Maui and Molokai on one trip that lasts for approximately 55 minutes. Meet your personal pilot at the exclusive launch pad at the Kahului Heliport. Once all buckled up, you set off along the coast line to see the world's highest and most imposing sea cliffs, located on the Friendly Isle, Molokai. Then see the astounding Molokai's waterfalls, including the Kahiwa Falls which are the tallest of all the falls on the Hawaiian Islands. Fly over the remote north shore, impossible to reach by land, the Halawa Valley and see the colorful Molokai fish ponds. The helicopter then turns and heads over the channel where the massive Elephant Rock looms out of the sea. You are now back over Maui and flying over the famous lao Valley State Park, a vegetation-covered lava rainforest. Snap photos of the Honokohau Falls and views of the dormant volcano, Haleakala. After soaking up the sun and exploring the Island, the next best thing to do in Maui is to see the entire Island from the sky! 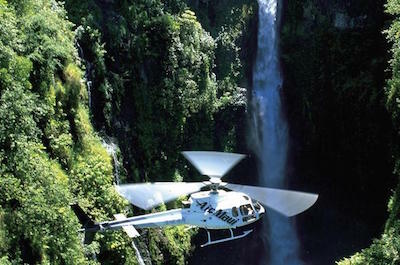 The Maui Dream is a Maui helicopter tour that will delight the whole family. Don't worry about flyers nerves, the views are so spectacular that you will soon have forgotten all about your fear of heights. Meet your personal pilot at the Kahului Heliport and set off on a 70 minute life-changing experience. As the helicopter rises up you will be treated to amazing views of the dormant crater, Haleakala, the West Maui Mountains, lao Valley State Park and the Hana Rainforests. Soar along the coastline and see hidden valleys, cascading waterfalls and dense jungle terrain, made famous by the Jurassic Park movie. The flight also offers views of the nearby islands and channels that link them. A perfect way to end your Maui vacation! If you have never flown in a helicopter before, this Maui helicopter tour makes the perfect start to get you hooked! Set off to the Kahului Heliport where you will be met by your professional pilot. The trip lasts for 1 hour and flies over the entire Island, giving you a bird's eye view of all the iconic sights. See the lush, dense Hana Rainforest of East Maui with its cascading waterfalls. Then peer down into the lunar-scape of the Haleakala Crater, a dormant volcano with a summit reaching more than 10,000 feet above sea level. The flight now heads west to the West Maui Volcano, surrounded by towering craggy cliffs, lava flows and cascading waterfalls. You will also see the cliffs on Molokai's remote north shore, the nearby island. As you fly, your pilot will update you on the history, geology and wildlife of the Island. Back on solid ground, catch your breath and buy the exclusive DVD of your trip to show off when you get home. Ever thought about travelling a road by car and by air? You can do this on our next spectacular Maui helicopter tour! This 6-hour luxury tour caters for small groups. Start off in an air-conditioned, luxury van in Kahului and wind your way along one of the most scenic drives on the planet Ð the Road to Hana. Stop at the delightful Hawaiian village of KeÕanae, the Waikani Falls and the WaiÕanapanapa State Park. When you reach Hana, relax in the fabulous Tropical Gardens and enjoy an exclusive tour where you will learn about the native Hawaiian people. Then enjoy a cooling dip in the crystal-clear pools under the cascading waterfalls. Lunch is served at a beach side cafŽ where grilled chicken, fish, fresh tropical fruits and more delicacies are the order of the day! 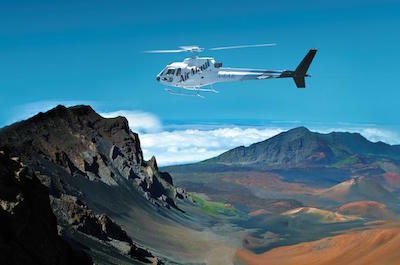 Now, jump into the A-Star Jet Helicopter for the reverse trip of a thrilling 36-minute flight as you soar above the world's largest dormant volcano, the Haleakala Crater. See the awe-inspiring waterfalls from high up and re-live Jurassic Park! 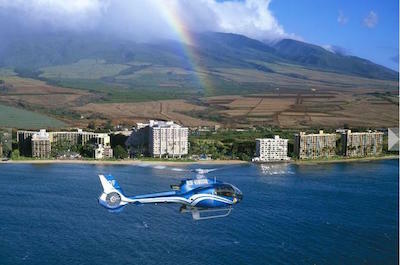 For a fun filled day in Maui with the family Ð consider a Maui helicopter tour. You will all be talking about it for months to come! Meet your private pilot at the Kahului Heliport and get ready to explore the Island from the air. Take off and head up to the dormant volcano, Haleakala, the largest in the world, offering surreal moon-like scenes in its depths and wonderful lava flows around the edges. You will then land on a private cliffside location for more breathtaking views over the Island and ocean. This memorable spot not only gives a massive adrenaline rush and demands some photos, but it makes the perfect romantic venue to pop the famous question! Your pilot will update you on interesting facts about the Island's culture, history and geology. Back in the helicopter, you will be treated to more amazing sights of hidden waterfalls, dense forests and lush valleys on your way back to Kahului. 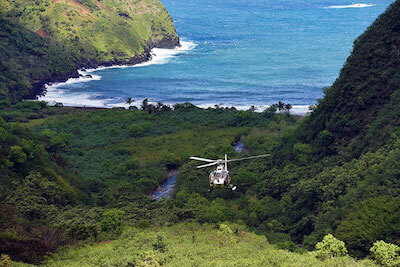 Don't even consider going home before you have experienced a breathtaking Maui helicopter tour! Meet your professional, personal pilot the Kahului Heliport and climb aboard for a fabulous 45 minute trip over the main attractions of the Island. The state-of-the-art helicopter features six forward-facing seats, offering each passenger unobstructed views. Relax and listen to the narration as you fly along. See the amazing Haleakala Crater, a sleeping volcano that towers 10000 feet into the sky. Peer down into the moonscape depths and be awed! Then re-live Jurassic Park as you fly over the spectacular waterfalls that plunge into the dense forest jungles of the Hana Rainforest. Soak it all up and when you land, a full DVD of your trip is available to purchase to take home as a memento of this stunning adventure! Trips in this luxurious aircraft are ideal for families and small groups, and are run to the highest and most professional standards. 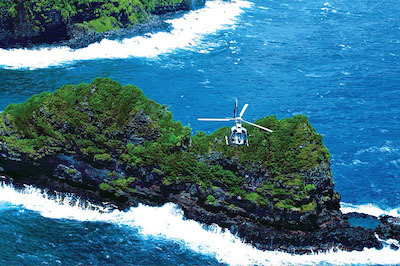 If you want to see landscapes that are inaccessible by foot or vehicle, then a Maui helicopter tour is the way to do it! Join this exclusive tour and set off on a 45 minute adventure. You will head west to see the deep valleys and massive rocky ridges of the West Maui Mountains and the imposing sea cliffs and waterfalls of the North Shore, which are inaccessible by land. Fly over the lush tropical rain forests and spot astounding waterfalls crashing down into azure blue pools. Be awed as you hover over the world's largest dormant volcano - the Haleakala Crater, known for its amazing lunar-like landscape and lava flows. The helicopter offers luxurious comfort and unobstructed views for a small group, perfect for a family or group of friends. Your guide will update you on all you need to know about the sights you are seeing and the culture and history of the Island. And, for an extra wow-factor, the entire trip is filmed and available on a DVD for you to purchase and take home to show off! 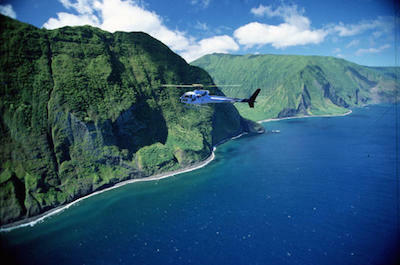 See two beautiful Hawaiian Islands on this spectacular Maui helicopter tour. Meet your pilot at the Heliport in Kahului and climb aboard, relax in the luxurious comfort and be wowed as you soar over cascading waterfalls, dense tropical rain forests and then out to sea where the massive sea cliffs of Molokai come into view. These areas are inaccessible by land, so you have a bird's eye view that will create memories to last a lifetime. Snap some photographs of the massive Kahiwa and see the dramatic Halawa Valley and the Molokai fish ponds. The tour now turns back and flies over the Pailolo Channel between the islands and back to Maui. Take photos as you fly over the famous Iao Valley State Park, the Honokohau Falls, MauiÕs tallest waterfall and the West Maui Mountains. Look out for the towering Haleakala volcano as you descend to catch your breath and relax with refreshing drink!